The Barbican is the first part of the castle that you pass through on your visit to Scarborough Castle. This collection of walls and towers was built to protect the narrow spur of land that spans the double ditch at the West side of the castle, providing not only the first point of access and defence, but no doubt providing visitors of the time, a symbolic vision of the greatness of Scarborough Castle, impressing upon them the vast cost of building this great structure and reinforcing the power and importance of those who lived here. Above. North walls from the Barbican bridge. 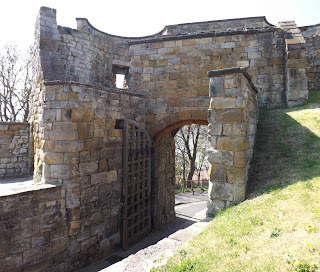 The small, twin towered Barbican gatehouse was built by Henry III between 1243 and 1245 and as very similar in appearance to other gatehouses of the time, namely those at Newcastle and Conwy Castle. Above. View of the North walls and interior of the Barbican. The leafy walk up to the castle these days belies the impressive array of defences employed during the castle's heyday. The area surrounding the ticket office was heavily defended with towers and thick walls. The road from this point, across the Barbican bridge and towards the Gatehouse, is shielded by 5 and a half metre high walls, with wall walks on either side overlooking the double ditch below. Above. The Barbican and bridge from the West walls. The walk would originally have been broken by two gaps, spanned by wooden drawbridges that could be withdrawn to prevent entry to the inner courtyard. These have long since vanished, and have been rebuilt in stone. A tower would originally have sat between each of the drawbridges, offering any would be attacker an almost impregnable barrier. The towers here, would also have had a portcullis, providing yet more solid defence. Above. The Barbican gatehouse from the West walls. Above. The Barbican gatehouse from Castle Road. Above. The Barbican gatehouse from inside. Above. The interior of the Barbican gatehouse from the wall walk. Above. Another view of the Barbican gatehouse. The Barbican is first mentioned in documents dating from 1175, and a tower dating from this period lays beneath the modern ticket office, possibly representing and original defensive feature of this part of the castle.